who enjoy living in England, once Great Britain, our still United Kingdom. This week saw me on our warmest day of the year so far, singing God Save The Queen (on her 90th birthday) in a chandeliered marquee on Lytham's Green, here on Lancashire's Fylde coast. It was an afternoon dinner dance as part of celebrations for St. George's Day - a neglected event becoming increasingly popular locally. 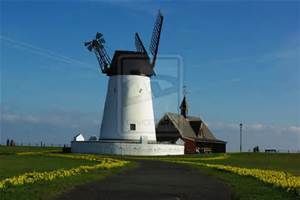 With sun glittering on nearby windmill, green promenade and distant sea, it was natural to share sentiments inspiring that famous speech, 'This sceptred isle . . . this blessed plot, this earth, this realm, this England'. They came, of course, from Shakespeare whose death 400 years ago we are also marking. The text is on our Poem page (see Pages for You near top of right column). The Memoir page will shortly feature my shocked impressions when first returning to England from abroad a few decades ago. It seemed a different land to that left so eagerly years before, the 'small world' I had felt nostalgia for as an expatriate and to where I had now eagerly returned. Our Story/Chapter page has an extract from my latest novel, a mystery death and romance entitled A Cut Above also set in Lytham and the coast. Details of all our available publications, on Kindle by Amazon or paperbacks sponsored by the British Arts Council, are on the Books page. There are links for further samples to read and to place orders. Any sales help pay for this non-profit-making but, hopefully, uplifting literary website. This is a beautiful country still and, for many, embodies a proud tradition of freedom, fairness and goodwill; as well as moderate seasons, improving food and good ale! We welcome you to a taste of it, as well as impressions and experiences - often humorous but also touching and romantic - from other parts of our wonderfully diverse world.